Amoderm Cosmetic and Wellness Medical Center in Irvine is your one-stop clinic for a healthier and rejuvenated look. Visit us for Botox, Dysport, Xeomin, Kybella, Juvederm, Radiesse, Restylane, Perlane, Belotero Balance, Bellafill, Juvederm Voluma, Juvederm Volbella, Sculptra, Chemical peels, Microlaser peel, Laser skin resurfacing, Fractional CO2 laser skin resurfacing, IPL Photofacial, Skin tightening, Body sculpting, Cellulite reduction, Radiofrequency treatments, SculpSure fat reduction and body contouring treatments, Venus Freeze, Microdermabrasion, Laser hair removal, Stretch mark removal, Spider vein removal, PDO Threadlift, Toenail fungus laser treatment, Facials, Latisse and more! Visit Amoderm Cosmetic and Wellness Center, Medspa and Skin Care Clinic today for a healthier and younger you! Conveniently located in heart of Irvine and easily accessible from Orange County major freeways, Amoderm is proud to provide cutting-edge cosmetic and wellness services and premium skin care products designed to provide antiaging, anti-acne, sun protection and other functions vital to healthy and youthful skin. 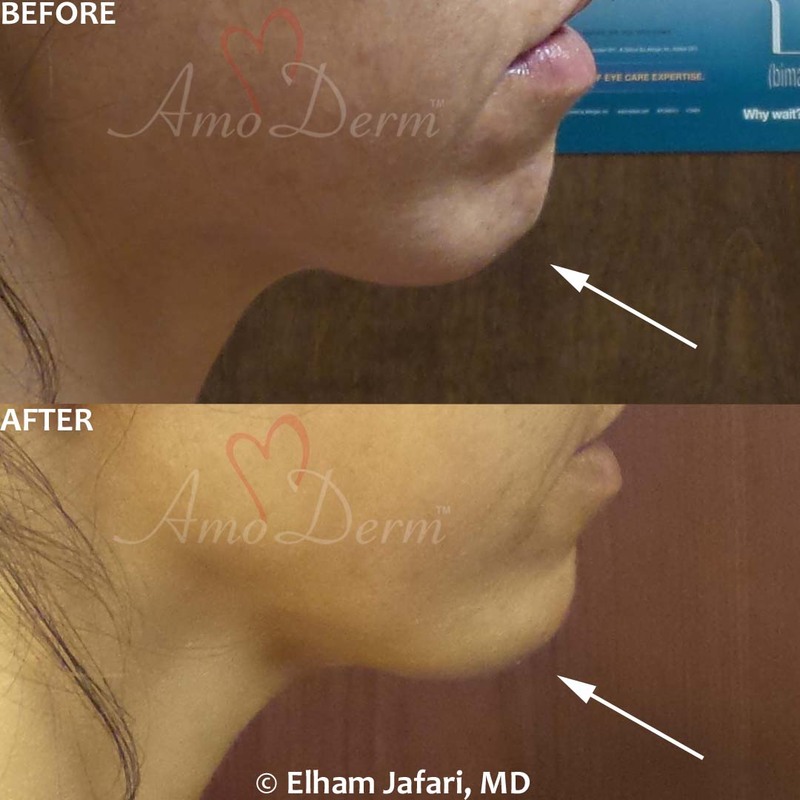 Under direct supervision of Dr. Elham Jafari, MD, a California-licensed, board-certified physician and an experienced aesthetic medicine specialist, Amoderm Medspa is pleased to offer an expansive list of professional medical cosmetic services including Botox, Dysport, Xeomin, Kybella, Juvederm, Radiesse, Restylane, Perlane, Belotero, Voluma, Volbella, Bellafill and Scluptra all injected skillfully by licensed physician and used individually or in combination for liquid facelift. Whenever indicated, we inject fillers using flexible Microcannula (micro-cannula) for better results, less pain and less bruising. Amoderm also offers various customized chemical skin peels, VI peel, Microlaser peel (laser skin resurfacing), IPL (Photofacial), skin tightening using laser and radiofrequency, Microdermabrasion, PDO Threadlift, Laser hair removal, Stretch mark removal, Laser vein removal, Spider vein removal, Toenail fungus laser treatment, Venus Freeze, SculpSure Latisse, and anti-aging skin care products. Call us today to schedule your free consultation! At Amoderm Cosmetic and Wellness Clinic, our goal is to create a healthy, natural and age-defying look. Our focus is on whole-face rejuvenation using a combination of fillers, neurotoxins (Botox, Dysport, Xeomin) and various laser and radiofrequency treatment. We offer various medical cosmetic treatments to enhance and accentuate your natural beauty. At Amoderm, we explore all options to rejuvenate, slow down and reverse the aging process using the most advanced, clinically-proven, affordable and safe treatments that are customized to your specific conditions and needs. It's all about you, and what is right for you. The good news is that many things can be done to effectively reverse the aging process without expensive surgeries and alike. Our patients often find it hard to believe what can be achieved in a single visit using a carefully selected combination of botox, dysport and filler injections and lasers. Our emphasis is on whole-face rejuvenation with natural-looking results. Often, years of aging can be undone in just a few minutes. - Botox, Dysport and Xeomin injections to wipe out dynamic wrinkles and more. Botox, Xeomin and Dysport are effective in reducing and removing wrinkles and fine lines. Additionally, Botox is FDA-approved for treatment of other conditions such as excessive sweating (hyperhidrosis), muscle stiffness (spasticity) and migraine headaches, which are also provided at Amoderm. Other cosmetic treatments we provide using Botox, Dysport and Xeomin include jaw slimming and jaw line reshaping, calf slimming, nose reshaping, eyebrow lift, treatment of neck (platisma) bands and more. Say goodbye to the wrinkles, fine lines, crows’ feet, frown lines, worry lines and forehead creases by Botox and Dysport injections and take years away from your face! - Filler injections (Juvederm, Radiesse, Sculptra, Belotero, Voluma, Volbella, Bellafill, Restylane and Perlane) to add volume and diminish wrinkles instantly. Dermal fillers are used to create volume under the skin in a fine and skillful procedure that has been likened to sculpting or non-surgical face lift. Dr. Jafari is highly experienced in using various dermal fillers such as Juvederm, Radiesse, Sculptra, Belotero, Restylane and Perlane to accentuate your natural beauty and defy the effects of aging. Juvederm, Belotero, Voluma, Restylane and Perlane are based on hyaluronic acid, a gel-like substance that is naturally present in skin, contributing to the firmness of young and healthy skin. 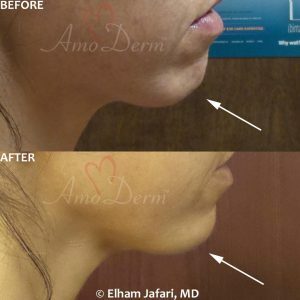 Dr. Jafari at Amoderm Med Spa can replenish the skin’s lost hyaluronic acid by injection of Juvederm, Perlane, Restylane, Belotero or Voluma. On the other hand, Radiesse utilizes a calcium-based microsphere technology, which not only provides immediate volume restoration, but it also stimulates the body to produce new collagen, creating much more long-lasting results. Similarly, Sculptra is derived from corn-starch and is highly effective in stimulating body to produce more collagen. Dr. Jafari skillfully injects the dermal fillers into areas such as smile lines, nasolabial folds, marionette lines, lips, tear trough, nose bridge, cheeks, chin, neck and hands and takes away years of age in a few minutes! Dr. Jafari is highly experienced in techniques such as microcannula injections, which can reduce the bruising associated with the procedure. - Medical-Grade Customized Chemical Peel including VI Peel and Obagi Blue Peel to create vibrant, healthy, and rejuvenated skin. - MicroLaser peel (Laser skin resurfacing) to rejuvenate the skin, for active acne and acne scar, stretch marks, pigmentation, skin sun damage, scars, and wrinkles. - Fractional CO2 laser resurfacing for deeper laser peels resulting in more effective skin rejuvenation. - IPL (Photofacial) to stimulate collagen and treat vascular lesions, sun damage, pigmentation, open pores, acne and redness. - Micro-needling (Microneedling, dermapen, dermaroller) to stimulate collagen, treat superficial scars and improve skin tone and texture. - Skin tightening to stimulate collagen, increased skin tone and tightness. - Laser spider vein removal to remove unsightly superficial veins such as the spider veins. - Medical-grade crystal-free diamond Microdermabrasion to treat superficial hyperpigmentation, photodamage, and fine lines. - Laser hair removal for a silky-smooth, vibrant and maintenance-free skin. - Stretch mark removal to effectively reduce the appearance of stubborn striae and stretch marks. - Toenail fungus Laser treatment to safely, effectively and permanently treat toenail fungus. - Radiofrequency and Venus Freeze treatments for body contouring, skin tightening, wrinkle reduction, cellulite treatment and size reduction. - Platelet-rich Plasma (PRP) to rejuvenate face using body's own growth factors (optionally combined with fillers). - Signature Facials to promote your natural beauty and the health of your skin. - Wellness program for better health, better management of chronic diseases and weight adjustment. DISCLAIMER: Every patient is different. Individual results may vary and no guarantee can be made. We will discuss your treatment(s), expected results, possible risks, costs and alternative options with you during your visit. Statements provided in this website are for informational purposes only and do not constitute medical advice. The content here is not intended to be a substitute for professional medical advice, diagnosis, or treatment. Always seek the advice of your physician or other qualified health provider with any questions you may have regarding a medical condition. Never disregard professional medical advice or delay in seeking it because of something you have read here. If you think you may have a medical emergency, call your doctor, go to the emergency department, or call 911 immediately. Amoderm Medical Spa is located in Irvine, California. We proudly serve clients from all cities & neighborhoods in the OC including Aliso Viejo, Anaheim, Anaheim Hills, Capistrano Beach, Corona Del Mar, Costa Mesa, Coto De Caza, Crystal Cove, Cypress, Dana Point, Fashion Island, Foothill Ranch, Fountain Valley, Fullerton, Garden Grove, Huntington Beach, Irvine, Ladera Ranch, Laguna Beach, Laguna Hills, Laguna Niguel, Laguna Woods, Lake Forest, Mission Viejo, Newport Beach, Newport Coast, Orange, Pelican Hills, Placentia, Rancho Santa Margarita, San Clemente, San Juan Capistrano, Santa Ana, South Coast Plaza, Surfside, Tustin, Tustin Legacy, Tustin Ranch, UCI, University Park, Westminster, & Yorba Linda. In addition to the cities in the Orange County, Amoderm Medspa often provide services to clients from other counties including Los Angeles, San Diego, Riverside & San Bernardino & other cities and counties in Southern California. © 2018 Amoderm Cosmetic and Wellness Medical Center - Irvine, Orange County. All Rights Reserved.